Necessity may be the mother of invention, but sometimes it is opportunity that creates a context ripe for thoughtful design intervention. We talked to UX Designer Jared Foote of Deloitte Digital about one such initiative – an ingenious data dashboard for their busy Toronto office tower. Integrating 3D printing into a Lean UX process provided the ability to iterate and prototype – not just on screen but in the physical world. The digital team set out to create a real-time visualization of what was going on in the building – aptly named the ‘IoT (Internet of Things) Board’. Its inception turned the everyday refill ritual into a fun, participatory narrative: what floor is the most caffeinated? What hour of the day do folks drinking the most coffee? There was no question that enough data could be captured across BAEs many floors to generate interesting and helpful information for all occupants. Data decisions included monitoring network traffic to show which floors are busy, displaying the IT support queue to save time; broadcasting extracurricular classes (Yoga, Boot Camp, etc.) to promote life-work balance. The display that utilized 3D printing know-how from Hot Pop Factory dealt with the most important measurement of office life: coffee consumption. Every coffee pour in BAE is measured. A raspberry Pi 3 (mini-computer) sensor assembly, housed in a 3D printed enclosure, is connected to each of BAEs coffee machines. Its job is to detect vibrations. WiFi dongles then aggregate the sensor assembly data across floors, populating the main dashboard with caffeine stats. Simple, right? The ability to test ideas quickly at this stage of the process is critical to execution. Digital fabrication technology like 3D printing is invaluable to projects like this, which require iterative prototypes – fast. 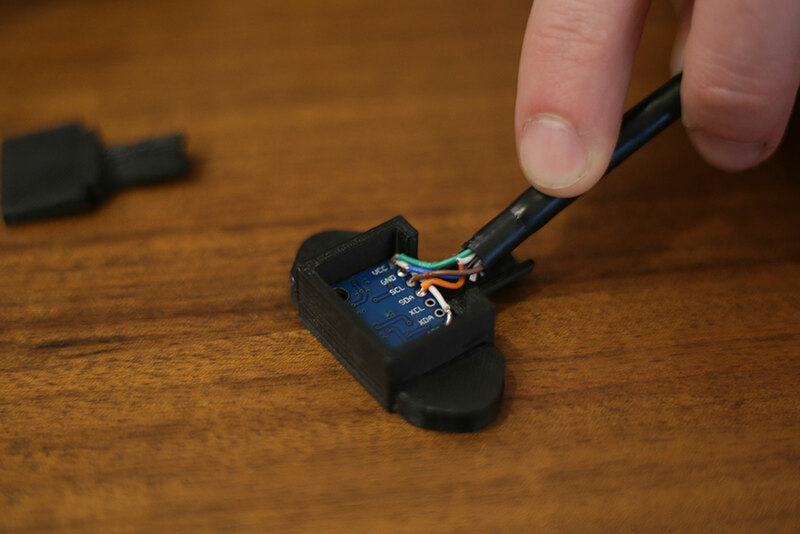 ”The enclosures we designed improved on an earlier prototype, based around a Raspberry Pi 2 built for the same job. After temporary deployment for testing, there was a range of issues – primarily disconnections.” As the team solved for technical glitches and swapped components, they were able to work fluidly – printing new enclosures, and quickly re-deploying them with minimal fuss or downtime. Jared’s right, of course, by integrating 3D printing into their Lean UX process, his team can quickly iterate in the world as quickly as they can through code. It’s a prime example of how organizations can get creative with their data, and create value from untapped (or explored) resources. How the future plays out, of course, remains to be determined; but rest assured the tight integration of software, hardware, and digitally fabricated materials will play a big role in shaping our vision of what is possible. Learn more about Deloitte Digital’s IoT Board on their GitLab blog. Hot Pop Factory works with amazing people who create amazing things. 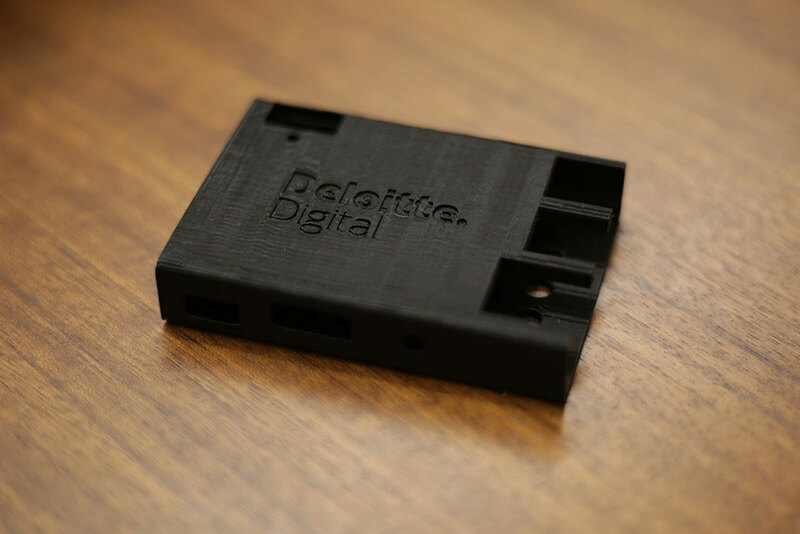 If you’re inspired to use digital fabrication technology like 3D printing, laser cutting, or laser engraving in your next project, drop us a line! Images courtesy of Deloitte Digital.